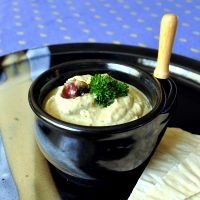 With its nutty taste and creamy texture, this Lebanese dip is very healthy and it even won the vote of some reluctant eggplant eaters in my household. Preheat the oven to 160 degrees Celsius fan forced. 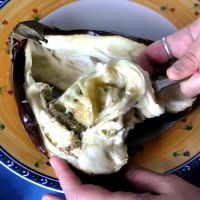 Prick the eggplant with a fork in several places and put it in the oven for about 45 minutes, or until the flesh is soft. You can check this by sticking a skewer through the eggplant. 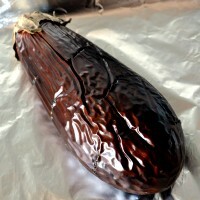 Once cooked, remove the eggplant from the oven and let it sit for a few minutes until cool enough to handle. 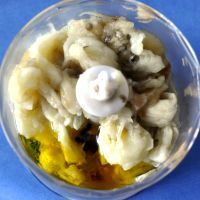 Cut the eggplant down the middle, spoon the flesh out and transfer it to the bowl of a food processor. Add the garlic, lemon juice, tahina, olive oil, parsley and season with the chilli, salt and pepper to taste. Process until you obtain a smooth paste. Check on the seasoning and transfer to a bowl. Serve the baba-ghanoush at room temperature with flat bread and olives.